Break the mold. Use only the best materials for your next construction project. Our precast concrete products ensure ultimate quality and durability for your building project. While standard “tilt-up” concrete panels are poured on-site, precast concrete (as the name implies) is poured off-site, usually into a particular shape or mold. Once solid, the precast concrete slabs are then transported to the site to be used in construction. Whether you are remodeling an existing workspace or are adding onto your business, you want to use the best materials to ensure that your building will last for years to come. A warehouse is a commercial or industrial building that houses goods and products, serves as a space for construction or manufacturing, and much more. Many business owners use warehouses for industrial work or storing wholesale goods. Others store agricultural equipment, building materials, perishable goods, or retail products. Really, the uses for a warehouse are nearly limitless and depend on the needs of the individual business. 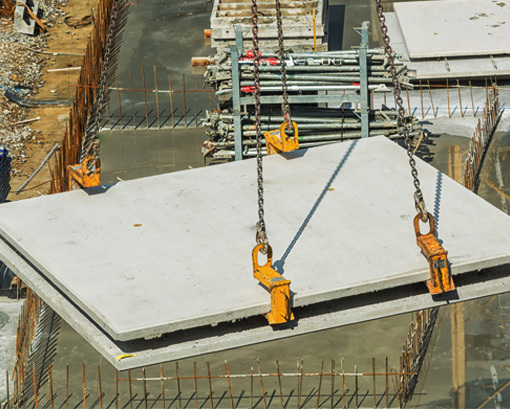 For one, precast concrete can be ordered in advance in order to prevent delays during construction. In fact, many companies carry precast concrete panels in bulk, so you may only have to wait for transport to your construction site. Preparing concrete off-site is also safer than pouring it on-site, as it is poured in a controlled environment and at ground level. This also ensures better quality control by the work of concrete professionals. Best of all, concrete prepared at a precast plant tends to be more affordable than custom pours. The company utilizes reusable molds, making it cheaper than on-site, “tilt-up” panels. This can be a good option for concrete walls, facades, and divides. The nature of the material makes it incredibly energy efficient due to its insulative qualities. Precast concrete panels can help keep the warm air in and the cool air out, and vice versa. It is also incredibly durable, which means less energy and money to be used on repairs later on. How Much Do Precast Concrete Panels Cost? Every precast concrete plant does things a little differently, and costs can depend on your unique specifications and the location of your project. To find out how much using precast concrete will cost for your project, reach out to Asset Building Systems for your free, no-obligation quote. We will take all of your project factors, including your budget, into consideration to find the right rate for you. Cut the costs of pouring concrete on-site and order concrete panels to be sent directly to your construction site. With precast concrete, you can get your project off the ground in less time and at a more affordable price. We offer fixed pricing to ensure that you are getting the same price with no surprises. Our team will also fully manage your project to make sure everything is in order and running on time. That means less energy spent on worrying about your project and more energy spent on what matters most in your business - your customers. Worried about hidden costs or delays in delivery? To get started on your project, speak to an expert at Asset Building Systems for your free custom quote. No obligation, guaranteed! Precast concrete panels are typically used for walls and dividers in commercial building projects. With the variety of shapes and sizes available, they can be used for virtually any kind of building or structure, including schools, offices, hotels, homes, apartment building, factories, and more. The durability of this material makes it perfect for projects that may face a lot of wear and tear. Though perhaps not the most “pretty” of solutions, precast concrete is made to last and protect your business, products, and equipment from the elements. Your business deserves only the best materials and construction team when it comes to your construction projects. Unfortunately, many companies come up short in professionalism, quality, and affordability. With Asset Building Solutions, you can trust us to provide durable and affordable construction materials, as well as fully-managed construction services. The end result is a construction project that comes together exactly how you want, without the hassle of having to manage all of the details yourself. Using precast concrete panels in your next construction project is an affordable alternative to concrete that’s poured at the construction site. It is also highly durable and resistant to wear and tear compared to other building materials, which saves you money in the long run. At Asset, we also work hard to make every step of your construction planning process as affordable as possible. In working with a construction company, it’s important that you have clear communication every step of the way. From pricing to deadlines to the team working on your project, you want to be sure that you are getting the best plan for your needs. At Asset Building Systems, we know that large construction projects are a huge undertaking with many moving parts. We aim to help business owners navigate this process with ease, without pulling away from the primary responsibilities of their business. That’s why we offer full management of your projects. We ensure that there are no unexpected costs, delays, or missed “red-tape” to go through. That way, your project can come together in the expected timeframe and within your budget. Want to know more about how precast panels are made and how to use them in your next construction project? Learn all about the entire process below. First, our team will work with you in creating a design that meets your specification. The precast panel is designed using the latest CAD software and the designs are sent to precast manufacturer. Next, proper framing of the panel is put together. The precast panel is framed and plotted according to the size and shape of the designs provided by our team. It’s important to make sure that all of the necessary features are in place. Electrical and water source components for your building are integrated into the wall by placing them in the frame at the precise locations specified by the CAD drawings. Now it’s time to pour the concrete! Concrete is brought in and poured to fill the cast. The type of raw concrete material is dependant on the engineering specifications for your building or structure.